Please note that the above slideshow is automatically created by searching Flickr and does not contain manually curated images. Hence, it is likely that some images may not be exactly of Mimusops elengi. Sapotaceae Trees or shrubs , usually producing latex. Leaves spirally arranged or alternate and distichous, rarely ± opposite, sometimes crowded at apex of branchlets ; stipules early deciduous or absent; leaf blade papery or leathery, margin entire. Flowers bisexual or unisexual , usually in sessile axillary clusters , rarely solitary; cluster pedunculate or in raceme-like inflorescence, bracteolate . Calyx a single whorl of usually 4--6 sepals, or 2 whorls each with 2--4 sepals. Corolla lobes as many to 2 X as many as sepals, usually entire, rarely with 2 lacerate or lobular appendages . Stamens inserted at corolla base or at throat of corolla tube , as many as and opposite corolla lobes to many and in 2 or 3 whorls; staminodes when present alternate with stamens, scaly to petal-like. Ovary superior, 4- or 5-locular, placentation axillary; ovules 1 per locule, anatropous . Style 1, often apically lobed . Fruit a berry or drupe, 1- to many-seeded. 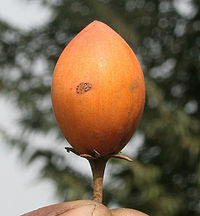 Seed coat brown (pale yellow in Pouteria annamensis), hard, shiny, rich in tannin; endosperm usually oily; seed scar lateral and linear to oblong or basal and round. Bullet wood is an evergreen tree reaching a height of about 16 m. It flowers in April, and fruiting occurs in June. 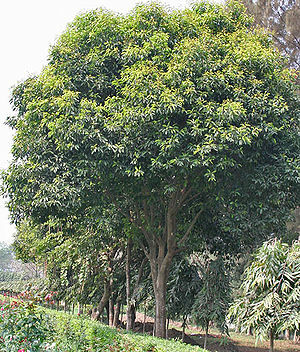 It is a medium-sized large tree growing on tropical forests in South Asia, Southeast Asia & Northern Australia. Leaves are glossy, dark green, oval shaped, 5–14 cm long and 2.5–6 cm wide. Flowers are cream, hairy and scented. Bark is thick and appears dark brownish black or grayish black in colour. It may reach up to a height of 30–60 ft with about 1 m in circumference. (Wikipedia)" cannot be used as a page name in this wiki. If no maps are displayed below, it means the required data is absent. Click on "Edit with form" button on top of the page to add this information. 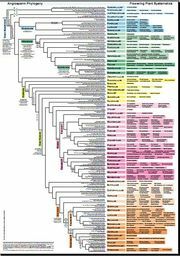 Organ-specific disorders The bark, flowers, fruits and seeds are astringent, cooling, anthelmintic, tonic, and febrifuge. It is mainly used in dental ailments like bleeding gums, pyorrhea, dental caries and loose teeth. Extract of flowers used against heart diseases, leucorrhoea, menorrhagia and act as antiduretic in polyuria and antitoxin. The snuff made from the dried and powdered flowers used in a disease called Ahwa in which strong fever, headache and pain in the neck, shoulders and other parts of the body occurs. For curing dental disorders, the tender stems or the powdered skin of the bark are used for cleansing the teeth . One combination of powders of its bark skin, roots of Kantakari (Solanum xanthocarpum), Saireyaka (Barleria prionitis) leaves and skin of an almond fruit is burnt into ash and is used to cleanse the teeth and strengthen them. For treating swollen and bleeding gums, the extract of its bark skin and that of Khadira (Acacia catechu) are effective when gargled. The unripe fruit is used as a masticatory and helps to fix loose teeth. The bark, flowers, fruits and seeds are astringent, cooling, anthelmintic, tonic, and febrifuge. It is mainly used in dental ailments like bleeding gums, pyorrhea, dental caries and loose teeth. It is said that Lord Krishna liked Bakul flowers very much. He used to play his flute underneath a Bakul tree in Vrindavan and the milkmaids used to get attracted towards the sound of the flute. Even today, Bakul flowers are offered during the worship of Lord Krishna. The ancient poet Kalidasa mentioned the Bakul tree in his creation Meghdoot. The plant is also listed in Charaka Samhita and Shushruta Samhita as having medicinal properties. The M. elengi plant has strong wood which is used for purposes such as building bridges, home construction,shipbuilding,flooring,doors, poles, foundation sills, railway sleepers, paving blocks, mine timber, furniture and cabinet work, vehicle bodies and wheels, turnery, tool handles, walking sticks, weaving shuttles, toys, sporting goods and musical instruments. Tree is planted as an ornamental shade. It can provide environmental benefits because of its large size when mature. This page was last modified on 14 November 2010, at 10:47.